Selecting your flowers is the first thing you’ll need to do when you’re creating a spring bouquet. We love anemone and peonies, so we’ll probably use those for our next springtime arrangement. But, you can choose whatever spring-blooming flowers you like. Some excellent choices are daffodils, poppies, lilac, tulips, and hellebores. Consider opting for pastel shades of these flowers, with pink and yellow blooms as focal points. When you’ve chosen your flowers, it’s time to make your bouquet. You’ll want a pretty vase, or a perfect paper, to hold your spring arrangement in. Be creative and go with whatever embodies springtime for you. To make a loose bouquet, we’re thinking some simple brown or white paper to wrap the flowers in would be lovely. If you arrange your flowers in a vase, following the directions we’re going to give you and plop your blooms in your vase. If you want a loose bouquet wrapped in paper, grasp the flowers in your hand as you arrange them, then wrap them up. 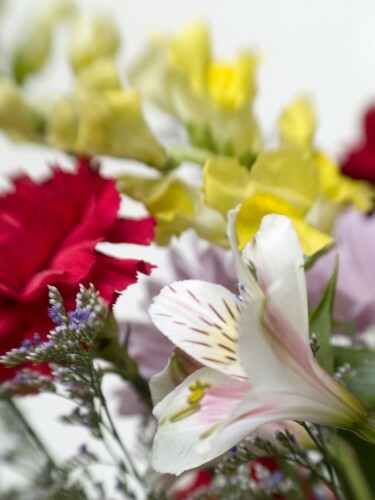 To start, create a foundation for your bouquet (which will be like a web to put other flowers into) of wood-stemmed flowers like spirea or lilac. Next, add focal flowers that stand out and yell “it’s spring!” Ranunculus or daffodils are perfect. These will help create your bouquet’s shape. Finally, thrown in a few wispy flowers that will lighten and things up, just like spring does. Maybe some show-stopping poppies or sweet peas. It’s okay if these flowers take over the entire arrangement and end up getting most of the attention. Now, you’re done with your spring bouquet if you’re arranging flowers in a vase. If you opted for paper (or even ribbon or twine) to bind your arrangement, wrap up your flowers and then give them away (or gift yourself with it)!